I was asked to examine this horse after a pre-purchase examination. 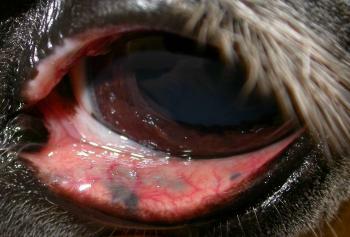 The 10 year old grey horse has a melanoma under its tailbase and these lesions in its conjunctiva. What are they and do they signal something serious? Here’s the melanoma on the tailbase – sorry if its a bit out of focus but I’m not as good at taking pictures of bums and of eyes! The consensus here is that melanomas are only very rarely distantly metastatic and that these grey lesions are likely to be benign naevi and not metastatic foci. But I’d be glad to know your opinion – the vendor is not keen to investigate further so we may never know! This entry was posted in Cases and tagged conjunctival melanoma, Horse. Bookmark the permalink. On the horns of a dilemma!